When using an Android device, it's a good idea to look at what permissions the app asks for. 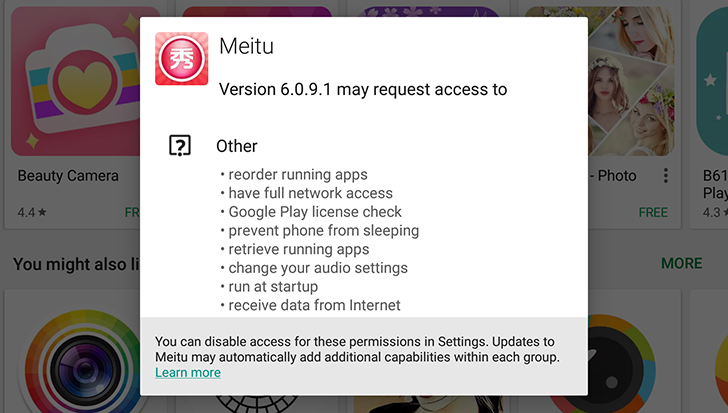 Meitu's APK manifest asks for no less than twenty-three permissions, including full network access, the ability to change settings, exact location, MAC address, local IP, and more (here's a pastebin we uploaded if you're curious). Twitter user @rekrom12 found that MTAnalyticsAdLogEntity.java inside the APK contains code for sending several details about the device for analytics. This includes the device's model, resolution, Android OS version, MAC address, IMEI, and more. We have confirmed this as well. In addition, user @FourOctets intercepted the app's network activity, linking it to several Chinese IP addresses. It's worth noting that we have not confirmed this ourselves, only the presence of analytics code. @Laughing_Mantis I had my doubts but guess what! In summary, you really shouldn't download Meitu unless you don't mind having spyware. The funny and somewhat-disturbing selfies aren't worth it.